The RSW 7th Open Summer Exhibition is this year returning for the fourth time to the Meffan Museum & Art Gallery in Forfar. 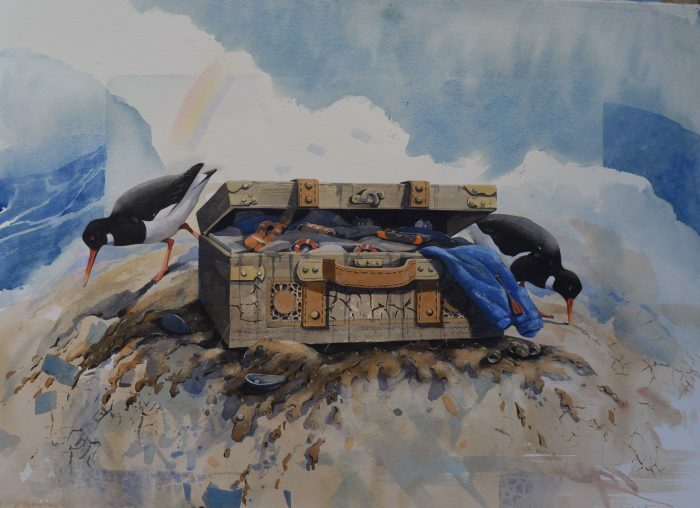 The exhibition, open to all watercolour artists in Scotland, is one of the key dates on the Scottish arts calendar and will show new works by some of Scotland’s leading artists alongside talented young artists from across the country. The exhibition will feature the painting “Beach Of The Nine Living” by artist Derek Robertson RSW (above). Explaining the inspiration he said “Shellfish are not generally eaten by the Highlanders, perhaps because they have a social history as starvation food. There is a beach on Tiree with the name of this painting because a widow and her eight children survived a winter there during a famine living only on shellfish and seaweed. The Highlands and Islands have a strong tradition of peoples’ flight from starvation and eviction. Award winning artist Derek Robertson RSW lives in Balermino, Fife and studied at Duncan of Jordanstone, University of Dundee. The first RSW Summer exhibition was held at the Maclaurin Art Gallery in Ayr in 2012 and since then it has also visited Perth Museum and Art Gallery and Lillie Art Gallery in Glasgow. The exhibition opens at Meffan Museum & Art Gallery, 20 West High Street, Forfar on Sat 19 May 2-4pm, with a free event, all welcome. The exhibition continues until Fri 29 June, opening hours Tues – Sat 10am – 5pm.